When we see an object, we evaluate it based on our previous experiences. The primary value of objects, familiarity/novelty, is represented by neurons in the perirhinal cortex located at the final stage of the ventral visual stream. This study investigated a causal link between the activity of perirhinal neurons and the judgment of familiarity/novelty by combining optogenetic stimulation and psychophysics in macaque monkeys. Monkeys first memorized 20–30 visual objects during a learning period lasting a few months. Then, in stimulation experiments, the monkeys judged whether a presented object was “familiar” or “novel”. When projection neurons were selectively activated by optogenetic stimulation, “familiar” judgments increased, regardless of whether the monkeys actually memorized the presented objects and whether the stimulated neurons coded the memorized objects. By contrast, when diverse types of neurons, including inhibitory neurons, were electrically stimulated, “familiar” judgments increased or decreased depending on whether the stimulated neurons coded or did not code the memorized objects, respectively. Based on these results, this study proposes a model of familiarity/novelty judgment. Perirhinal neurons output an object-general signal informing “found in memory”. When this output reaches a given threshold, an object is deemed familiar. When this output fails to reach the threshold, an object is deemed novel. The present findings enhance understanding of how humans behave adaptively through subjective evaluation of the visual world based on personal preferences and previous experiences. Furthermore, this study provides a methodological foundation for dissecting causal neuronal circuits of cognitive functions in primates. Conversion of object identity to object-general semantic value in the primate temporal cortex. Tamura K, Takeda M, Setsuie R, Tsubota T, Hirabayashi T, Miyamoto K, Miyashita Y.
Neuronal signal for subjective evaluation of objects in the primate temporal cortex. (Top) When we see an object, we have different impressions depending on our previous experiences of it. For example, people living in Japan would judge fish widely consumed in Japan (right) as more familiar than tropical fish (left). 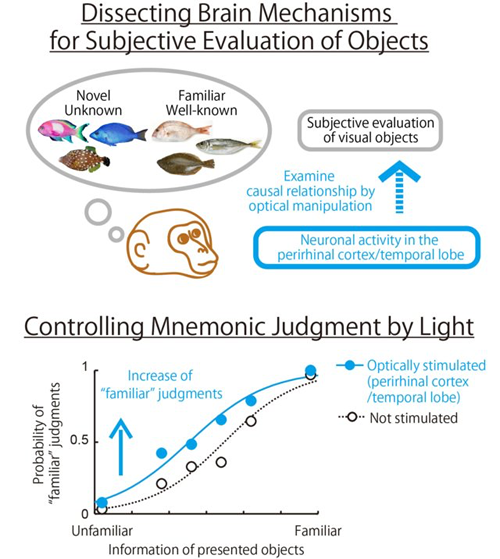 (Bottom) By using optogenetic stimulation in monkeys, this study demonstrates that the familiarity/novelty judgment of visual objects is causally determined by neuronal activity in the perirhinal region of the temporal cortex.